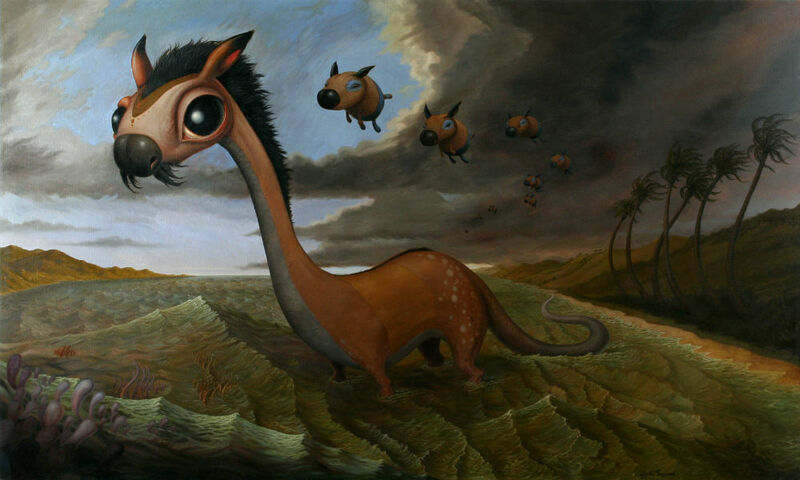 Scott Musgrove unearths previously undiscovered animals through a dedicated and scientifically un-approved practice of zoological impressionism. A lonestar in the field, he ventures where the gray-maned, khaki-clad, anthropologists with ivory walking sticks have not tunneling beneath freeways and ditch-combing along the rough borders of American mini-malls, in search of undiscovered and, up to this point, at least, extinct animals. Scott’s unorthodoxed research methods combined with his unmatched facility with paint and color result in a fascinating survey of what might have been in North America, if not for the invasion of pernicious settlers. Scott restores these beasts to life in his studio, stretching and stapling carpet scraps across ribs and skulls. With the help of a glue gun, a needle and thread, Scott sews and sculpts until the Harry Brook Trout or the Dwarf Basket Horse is finally staring back at him. cartoon like. Love the big eyes and long tail. The storm is approaching. I think this is the depiction of the dinosaur days. 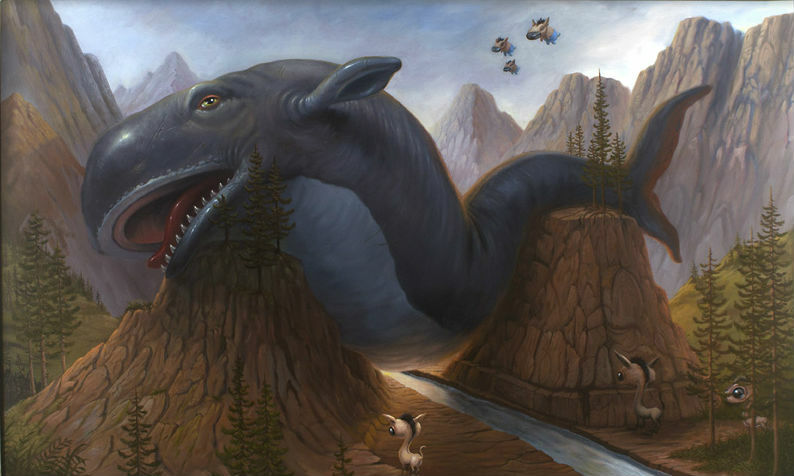 he likes dinosaures and beleives in things like how pigs can fly.